Selected contributions will be published in a special issue of the scientific journal X-Ray Spectrometry (Wiley Interscience). Regsitered authors of accepted contributions are invited to submit one manuscript for publication. No more than ONE manuscript by registered participant will be considered. 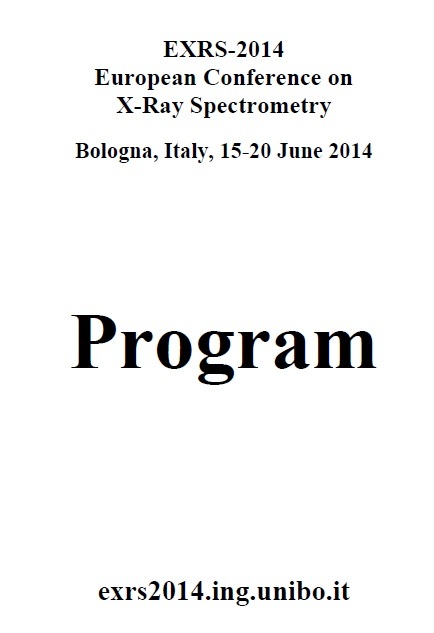 Manuscripts should be prepared in the strict format of X-Ray Spectrometry. No maximum number of pages has been specified. Manuscripts should be submitted to X-Ray Spectrometry following the instructions below. The new deadline for submission is September 30th 2014. If you have an account, please use your username and password to login. If you have forgotten your password, follow the instructions to generate a new password. If you have never submitted a manuscript before to XRS you probably should create a new account. 2) Log in using your XRS credentials and select Author Center. You will be redirected immediately to your personal page reporting statistics about your past submissions. 3) On the box Author Resources click to submit a new manuscript and follow the online procedure which will guide you on the submission. 4) The procedure requires the introduction of different types of data from authors names and affiliations, to title and abstract, to the upload of files for the manuscript, tables and figures. You can interrupt the procedure and complete it in a successive session. Please, remember to save the last input data. At point 1 (Type, Title and Abstract) of the manuscript submission, in the field Manuscript type, select Research Article. Later on, at the field Special Issue, select Yes. 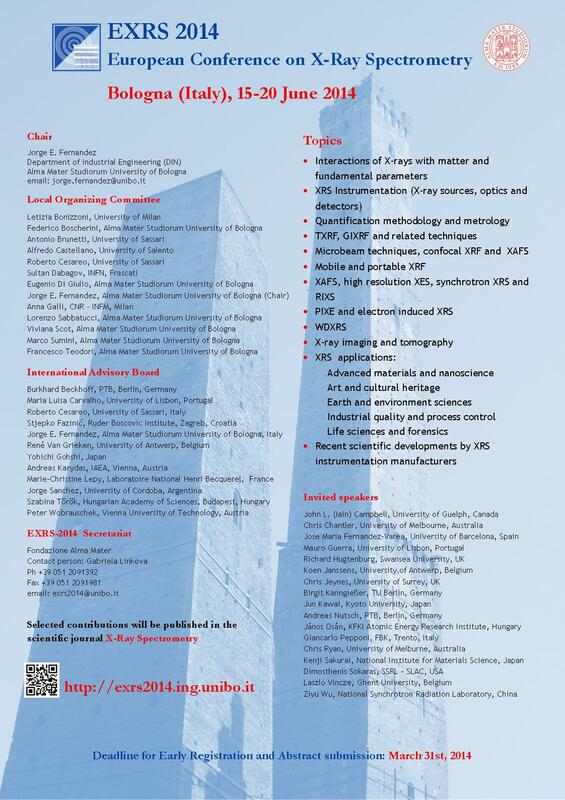 Oral and poster contributions are welcome on subjects within the scope of the conference. Authors are requested to submit abstracts, no later than 15 April 2014, according to the instructions below. Authors will be informed of the acceptance of their contribution and its presentation (oral or poster) before 30 April 2014. Only abstracts of registered people will be included in the book of abstracts. Presenters will have on disposal a digital projector and a PC running Microsoft Powerpoint. In particular, we would kindly ask our speakers to submit their Power Point presentations in a format compatible with Microsoft Office 2007, and to load their file on the presentation PC at 8:30 AM of the day of the presentation. Speakers should be present in the session Lecture Hall at least 15 minutes before the beginning of the Session in which they will give their presentation in order to introduce themselves to the Session Chair. Poster size should not exceed A0 (90 cm in width and 120 cm in height). Authors will have the opportunity to discuss their posters during the respective poster sessions. Posters should be displayed in the morning and should be removed immediately at the end of the respective poster session. Once you are logged to the site, to submit an abstract choose “New Submission”. Enter the Title and the Abstract in plain text in the reported form. This is only to help the system and the database, but the ABSTRACT MUST BE SUBMITTED AS PDF format according to this template. Please notice that abstract length must be limited to one A4 page as indicated in the template. UPLOAD THE FILE WITH YOUR ABSTRACT as .pdf format.